The modern marketer needs to embrace the entire sales and marketing funnel with open arms — they can't just zero in on generating leads or attracting traffic to their website. A siloed approach drives sub-par results, and to stand out and succeed in today's competitive market, you need to develop a marketing strategy that can address every stage of the customer lifecycle, from lead to evangelist. Creating a full-funnel marketing strategy requires taking a step back and gaining a high-level view of the funnel — and then connecting that broad, long-term vision with the short-term tactics that will get you there. Here are six of our favorite tips to help you create, manage and implement an effective full-funnel marketing strategy. You might be putting blood, sweat and tears into marketing your product or solution, but nothing you do seems to move the needle on your company's bottom line. What gives? Top-of-the-Funnel: At the top of the funnel, your prospects are just becoming aware of their problem, so this is where you attract traffic to your website, encourage blog or newsletter subscriptions and generate leads. To promote contact conversion at this stage, create educational content assets like blogs, guides and podcasts. Then, maximize the impact of these assets by optimizing your SEO and paid advertising strategies. Middle-of-the-Funnel: In the consideration stage of the funnel, your prospects will begin looking for a solution to their problem. Their actions during this stage will help your team measure their fit and interest and qualify them as marketing- and sales-qualified leads. To nurture your leads through this stage, create solutions-based content like informative webinars, templates and calculators. Bottom-of-the-Funnel: After your prospects have considered different solutions, they'll enter the decision stage of their buyer's journey. Help them make their decision by offering sales enablement assets like product demos, free trials and consultations. 2. Capitalize on your existing customers. Congratulations! You've closed a deal. But you can't stop there. As marketers, we often make the mistake of thinking of the buyer's journey as a linear journey with a beginning and an end. However, just because a customer closes, that doesn't mean you can't still market to them about new products or upgrades. Marketing actions directed at existing customers can aid in retention efforts, and upselling can offset the cost of acquisition. After a customer closes, think of them as a lead again. Retention and upselling serves as a "micro funnel" within your greater sales and marketing funnel, so use similar tactics to educate them about their problem, explain how your new product solves for their problem and urge them to book a time to talk about it. At this point, you've collected a wealth of information about each of your customers, so you have the advantage of creating highly-targeted and contextually relevant campaigns. 3. Use outbound tactics to amplify your inbound strategy. Another common mistake that marketers make is not directing enough — if any — attention to paid advertising. With the inbound marketing craze, some people have sworn off advertising altogether. We get it — we love inbound marketing too! But it doesn't have to be either-or when it comes to inbound and outbound marketing tactics. When approached in an inbound way, outbound tactics like paid advertising can enhance and amplify your organic traffic; just make sure the content you offer through these channels is helpful, targeted and contextually relevant. 4. Find synergy between your marketing and sales teams. Many marketers are measured on the number of leads they generate rather than their contribution to revenue, so they don't always pay attention to whether or not the leads they're generating are becoming opportunities. Likewise, sales representatives don't always have a clear understanding of the tactics and messaging that the marketing team uses to bring in leads. Don't lose sight of the big picture. If your sales and marketing teams aren't on the same page, creating a full-funnel marketing approach that attracts high-fit leads who later close into customers will be extremely difficult. For better sales and marketing alignment, bring the two teams together to discuss and agree upon defined lifecycle stages. Use a closed-loop reporting system to understand the full customer lifecycle — from first touch by marketing to the final deal with sales — and analyze these reports for insight into where both teams are excelling and where there might be room for improvement. 5. Train or recruit multi-faceted marketers. If you have a small marketing team, taking a full-funnel approach may seem like biting off more than you can chew. To stretch your limited time and resources more effectively, train your entire team to be "T-shaped" marketers, with a specialty in one area, but the ability to perform other marketing activities when necessary. When your marketers are jacks-of-all-trades and masters-of-one, you can ensure that each stage of the funnel is attended to, even when deadlines are tight and schedules are full. For example, one of your marketers might specialize in content creation, but if the need arises, they're perfectly skilled at SEO, email and other marketing activities and can take over when necessary. As your team becomes bigger and more sophisticated, your contact base will grow and you'll have the ability to create more segmented content. At that point, you might want to dedicated one marketer to each specialized area. However, smaller teams with fewer products and a smaller contact database can get away with having less variation in marketing content. 6. Fuel your approach with a comprehensive tech stack. A customer relationship management tool compiles all of the contact data you collect through forms and helps your salespeople organize and prioritize the leads passed to them by marketing. A marketing automation tool touches every aspect of your sales and marketing funnel and allows you to streamline standard marketing actions such as follow-up emails and social shares. A content management system allows you to host and optimize your content to increase organic reach. A business intelligence tool helps you measure the effectiveness of your efforts and understand where funnel gaps exist. As your team grows, you may want to invest in additional tools, such as video management, conversational marketing and partner management, but the list above includes the basics for a full-funnel marketing approach. 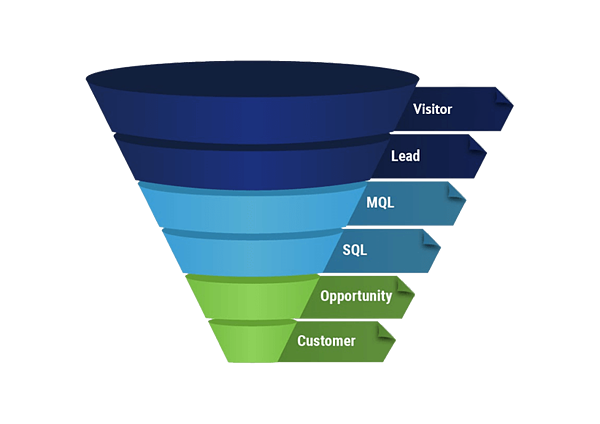 If you're not paying attention to each stage of the sales and marketing funnel, then your marketing strategy is severely lacking. Use the above tips, tactics and technology to reallocate your marketing calories toward a full-funnel approach, and you'll be well on your way to attracting high-fit leads, nurturing those leads into customers and driving revenue for your business.